PayPal is making it clear that hate isn't welcome on its platform. The online payments processor said it works to make sure its services aren't used to accept payments or donations that promote hate, violence or racial intolerance, according to a blog post on Tuesday night. That includes groups that encourage racist views, such as the KKK and white-supremacist organizations. "If we become aware of a website or organization using our services that may violate our policies, our highly trained team of experts addresses each case individually and carefully evaluates the website itself, any associated organizations, and their adherence to our policy," PayPal said in the blog post. The company declined to give further details about how its team determines who is ultimately blocked from the platform and why. The statement comes in response to violence in Charlottesville, Virginia over the weekend. Heather Heyer, a 32-year-old woman, was killed when a man plowed his car through a crowd counter-protesting a "Unite the Right" rally of white-supremacist groups. "Lives lost due to hatred and intolerance are a tragedy for every person in our nation," PayPal said. "Our hearts go out to the people of Charlottesville and all who have been touched by this unacceptable hatred and violence." However, one group is calling out PayPal specifically as being "integral" in raising money to organize the rally. The Southern Poverty Law Center, a nonprofit that monitors hate groups in the U.S., said organizers, speakers and individuals attending the rally used the platform to move money ahead of the event. PayPal declined to comment beyond the blog post. In its report on Tuesday, the Southern Poverty Law Center also called out specific accounts of white supremacist organizers and attendees who were permitted to use PayPal before and after the events in Charlottesville, despite PayPal's Acceptable Use Policy, which bans the promotion of hate, violence and racial intolerance. A CNN Tech analysis found that PayPal has since blocked payments to the majority of the accounts listed in the nonprofit's report, such as to Richard Spencer's the National Policy Institute, a white separatist think tank. A PayPal spokesman said the company doesn't comment on specific account information or provide status updates. However, the donate button for the think tank goes to a PayPal page that says: "This recipient is currently unable to receive money." The same message was displayed when donate buttons were clicked on other sites the group mentioned, such as Identity Evropa, Radical Agenda and the Revolutionary Conservative. Anti-Semitic website the Right Stuff had no option to donate through PayPal on its site, but CNN Tech found at least one offshoot site was still collecting donations through PayPal. Patriotic Flags, an online retailer that sells far-right flags and banners, still uses PayPal as a payment-processing platform. This isn't the first time PayPal has blocked payments to certain users. 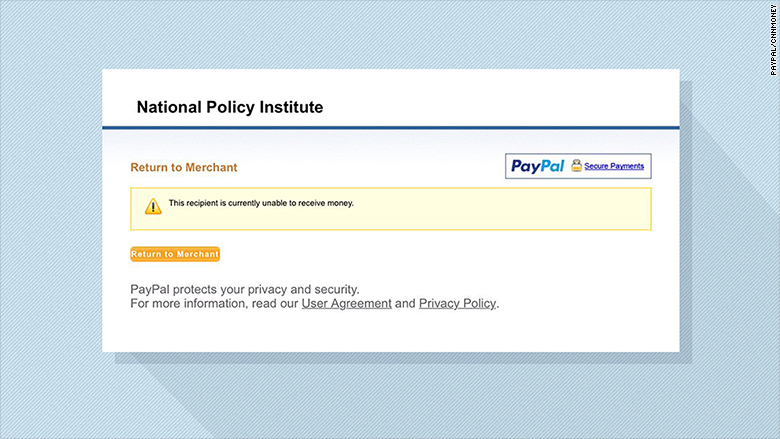 In May, white-supremacist website Occidental Dissent said PayPal canceled its account. The account of prominent supremacist Kyle Chapman was also reportedly deactivated. Popular crowdfunding site GoFundMe is also taking a stand against hate speech. 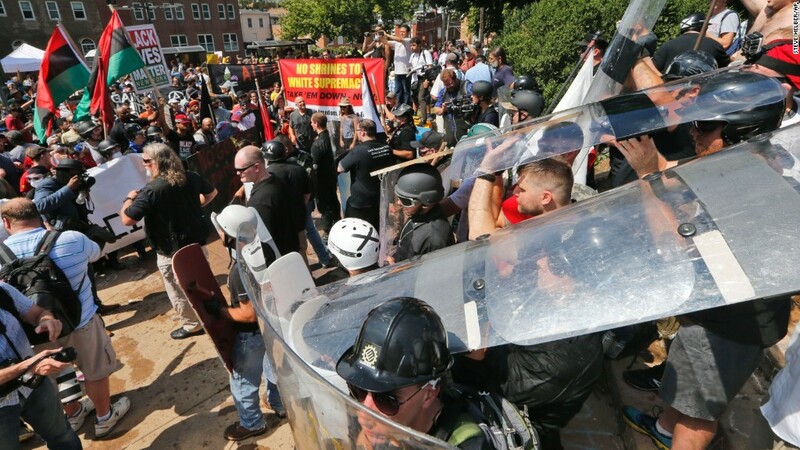 The platform shut down multiple campaigns this week to raise money for James Fields, the man accused of driving his car into a crowd at the rally on Saturday. "White nationalists and neo-nazis cannot use GoFundMe to promote hatred, racism, or intolerance, and if a campaign violates GoFundMe's terms of service, we'll remove it from the platform," a spokesman told CNN Tech. The company said those campaigns did not raise any money and were immediately removed. Earlier this week, GoDaddy (GDDY) and Google Domains (GOOGL) gave white supremacist and neo-Nazi website The Daily Stormer the boot after it published a derogatory story about Heyer, the Charlottesvile victim. However, this comes with the risk that these platforms will over-correct or ban speech too broadly and lose customers. "If these companies are viewed as over-regulatory [or] too active in censoring the speech of their customers, the customers will go elsewhere," Snyder said. Such platforms have already popped up in recent years, such as WeSearchr, a crowdfunding platform that doesn't place restrictions on campaigns, and Gab, an alternative social media network.